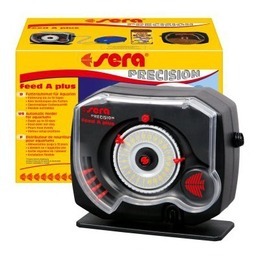 The sera feed A plus automatic feeder dispenses a pre-measured amount of food to your aquarium fish 1 to 12 times a day. The food quantity, number of feedings, and feeding times can be quickly set in a few short steps. Young fish, especially, grow faster and healthier when fed small amounts several times a day. The serafeed A is ideal for busy aquarists who can't always fit feeding times into their schedule. We recommend using a small pellet or granule food such as Vipagran with the Sera Feed A Plus.